Learn how we can implement the Windows LIVE authentication and access OneDrive for file open/upload using LIVE SDK in Universal apps (Windows Store/Phone 8.1). By Creating a Universal app, you will get two projects, project for windows store and project for Windows Phone by sharing the shared project. If you want to implement Windows Live Authentication in Universal apps, you should register your app in windows app store, for that you require a windows developer account. If you don’t have an account, please refer below link for licensing information. a) Select Windows Phone 8.1 project, open project from VS menu, select store and then clicks on Associate App with the store. b) Sign in with developer account, enter a Reserve a new app name, click on Reserve and then Associate. c) Once you associate, Package.StoreAssociation.xml file will be added to the project. Now we are successfully associated phone app to store. 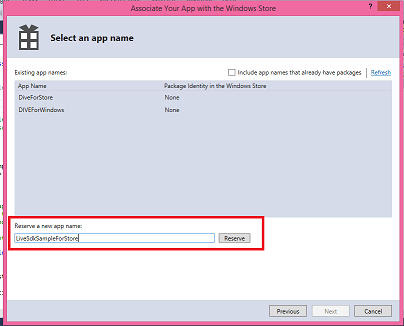 Repeat same steps for Windows Store project as well. 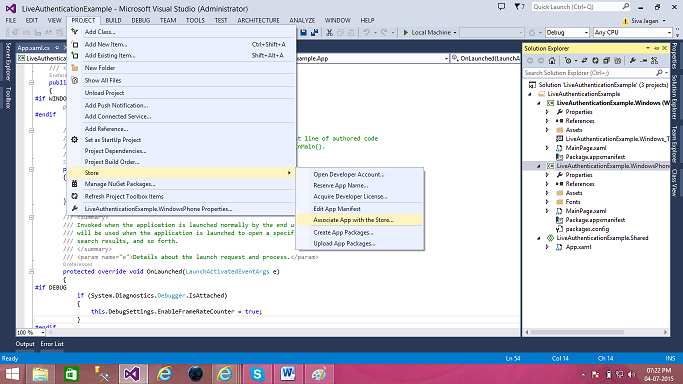 a) Add Nuget package live sdk to project. b) Use LiveAuthClient to perform basic authentication mechanism. Create an object for LiveAuthClient. c) Define login scopes; in this case I am defining basic scopes for Authentication and skydrive scopes for OneDrive operations. d) Pass defined login scopes to the LoginAsync function of LiveAuthClient which will validate user credentials with respect to the login scopes. f) Use InitializeAsync function for identifying whether the user is Authenticated, if not then only call the LogInAsync function. Complete code block as follows. Sequence of function calls as follows. b) Use below code for creating a folder in one drive. c) Complete function as follows. There is a FolderId for each folder in OneDrive. This FolderId is required while uploading a file to specific folder. In this case, you have a FolderId from CreateFolder function. Below piece of code used to get the folder id from OneDrive. When you want to edit the OneDrive document, we can use this feature to open the file in browser, where you can edit and Save. The file will be saved directly to OneDrive with latest changes. the result will have list of files information with link for opening the file. b) Pass this link to Windows Launcher to launch the file in browser. If you are launching first time, you need to provide your LIVE credentials, then file will be opened in edit mode where you can make changes and save the document back to onedrive.